Wearing compression gear doesn't mean you're guaranteed to smash your PB or avoid running injuries. Instead, you’ll feel the benefits of quicker recovery and improved performance making it a really easy and effortless trick to becoming a better runner. Proving that sport watches can be sleek and elegant too, the Forerunner 735XT packs a feature-loaded punch, crammed full of the latest technologies that meet the demande of even the most astute multisport watch user. 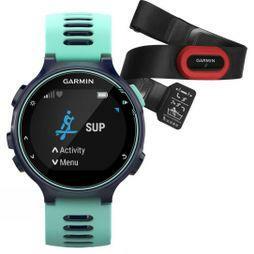 Garmin have expanded the multisport ability of their Forerunner model to include cross-country skiing, paddle sports, hiking, and strength training along with running, cycling, and swimming. Seperate profies for trail running can also be set giving you a truly holistic approach to your training. Swapping between outdoor and indoor training is easy and using the auto multisport feature, switching between sports in a du/triathlon takes just one press of a button. The Forerunner 735XT has inbuilt physiological analysis which provides metrics associated with stress, performance, and lactate threshold giving you an inclusive examination of how you are performing. A notable addition to this model is a wrist based heart rate monitor thats delivers extremely accurate data. Your heart rate data, along with your other metrics, can then be easily uploaded onto the Garmin Connect platform to scrutinise and develop your training and performance. Connectivity goes further with the 735XT as audio prompts, music control, and live tracking can all be set up. It also features all the smart notification that have become commonplace from Garmin, including incoming call and texts alerts – all with vibration alerts so you won’t miss a thing. You can also keep your phone in a safe place during your run while still getting the choice whether you respond to alerts or not, without fiddling about mid-stride. The Garmin Forerunner 735XT also offers full compatibility with the Varia cycling awareness system. Garmin’s unique Varia™ system helps create a safer environment and even displays your in-ride data exactly where you want it, in your line of sight. The Forerunner 735XT is available now at Runners Need with a complete Run bundle with a HRM-Run™ strap and a Tri bundle with a HRM-Tri ™ and HRM-Swim ™ strap.